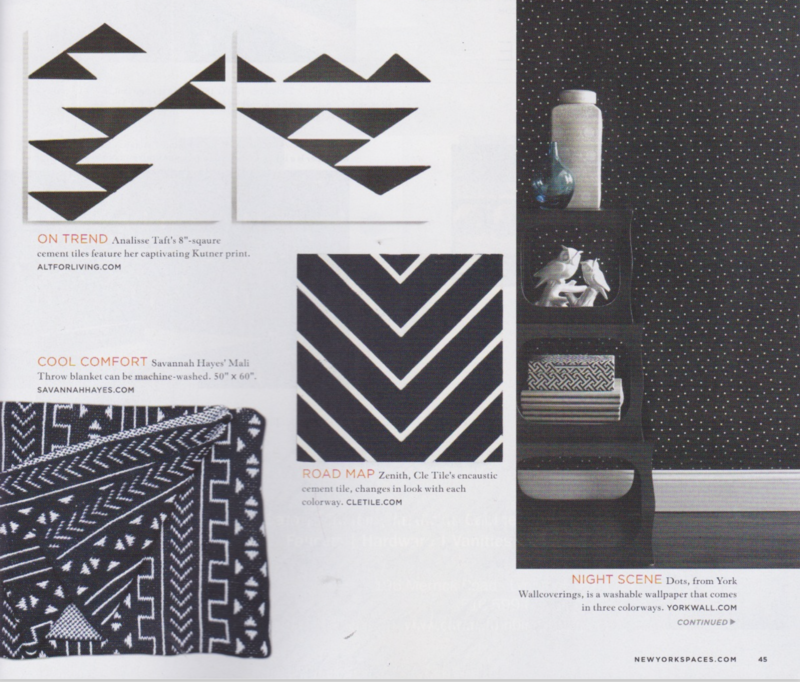 In the Fall 2016 issue of New York Spaces Magazine, the editors declared Black & White “A Fashion-Forward Pairing,” tapping the Kutner and Zenith Tiles from clé as noteworthy. View the Full PDF to see how graphically powerful these tile patterns are. Deborah Osburn, the founder of clé says of the Kutner pattern: “the talented Analisse Taft of the celebrated Alt for Living design studio presented a line of favorite retro textiles she carefully curated from her vintage textile collections. kutner was the first tile series clé created with Alt for Living for our cement tile collaboration and we’re thrilled to feature this tile in our stock section. Deborah Osburn, who has her BFA in sculpture, has been designing and manufacturing tile for the past twenty-five years for her company Tilevera. In 2012 she started clé, the international artisan tile e-boutique. The tiles on clé are as distinct as the artists who create them. It is Osburn’s goal to provide a forum for discovery and conversation about what she loves most, tiles created by impassioned artists creating remarkable surfaces. She has spent her career producing tiles.the act of tile making, along with an affection for art, fashion and design inform deborah’s tile collections.